We’re glad that you’ve taken some time to explore our program. We believe that there are two key ingredients to the wonderful summer experiences that kids have had with us at RBDC for the last thirty-eight years: Safety & fun. We want kids to take on new challenges, to try things they haven’t tried before, and to be open to forming new relationships. In order for any of this to happen, they need to feel safe, both physically and emotionally. We also want kids to have tons of fun at camp during the summer. We have a highly experienced and energetic group of counselors and specialists who love to teach kids new skills, and who love to have fun themselves. Our low camper-to-staff ratio allows us to get to know kids and their individual needs and lets us pay more attention to each camper so that we can help them have the best summer possible. We provide the structure and consistency from day-to-day that most kids need to be successful, yet we maintain a non-competitive, relaxed, positive and stress-free environment that allows kids to be themselves. We mix in a diverse blend of activities, as well as an assortment of fun and creative themes and special events. All of these ingredients add up to a great summer! We hope you’ll join our community this season. Please give us a call if you have questions, or if you and your child would like to come visit us to learn more about the wonderful opportunities that Running Brook has to offer. Campers enjoy a variety of activities, including music, sports, drama, arts & crafts, creative movement, Legos, woodshop, science, high ropes, yoga, karate, and cooperative games. Please note that Woodshop & High Ropes are only scheduled for campers in 2nd grade or higher. We offer bus service to local communities. Please see our Extended Day & Bus Service page for more details and for the list of bus stops. For the week of August 19-23, we are offering an exciting mix of DEILAB programming and Day Camp! Check it out here! 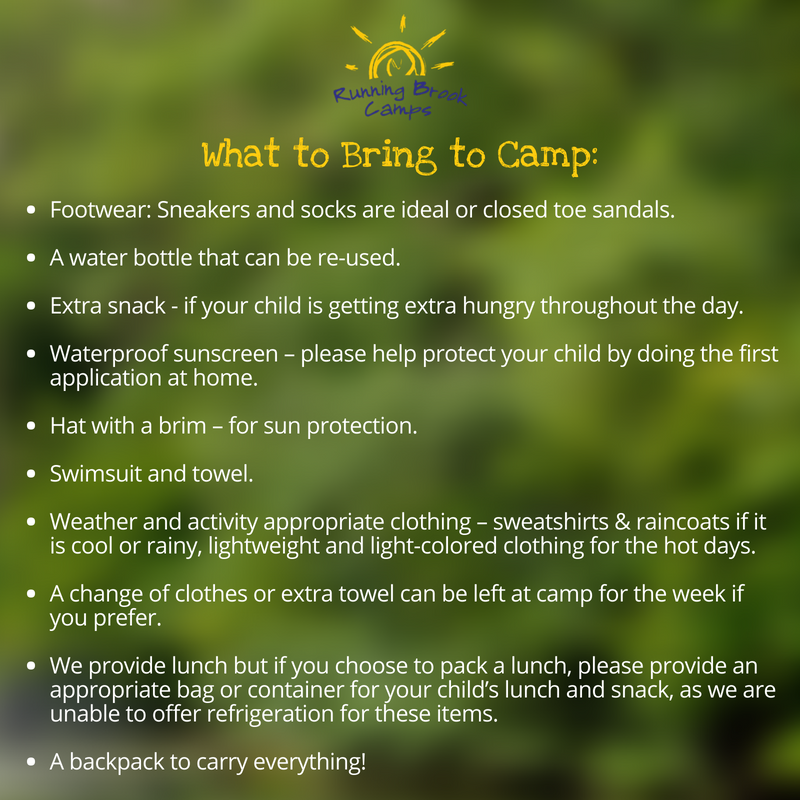 For more info on what to bring to camp click here!